The modern nation of Mayanmar, formerly known as Burma, sits geographically to the West of Thailand, to the East of India, with China to the North. During our travels through South East Asia a couple of years ago, we kept bumping into other travelers who had been to Mayanmar and raved about its hospitable peoples, the landscapes, and the incredible temples of Bagan. So this year we have decided to see it for ourselves! 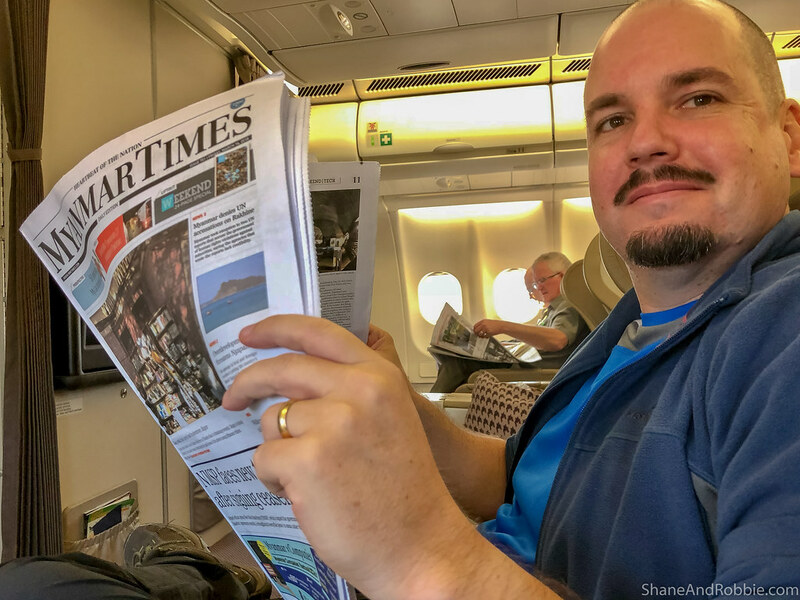 One of the ways we have coped with going from full-time nomads to productive members of Australian society again, is by continuing to travel regularly. Continuing to expand out horizons and experience new places. 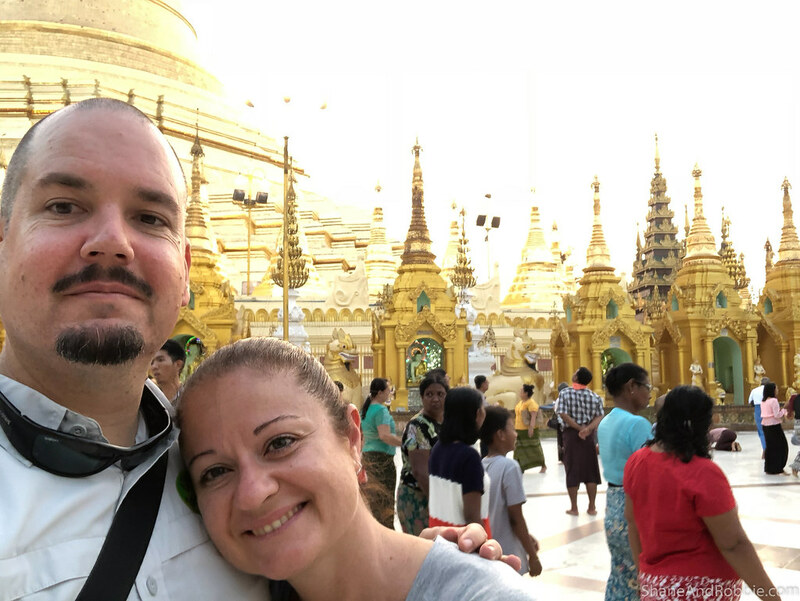 For 2018 we chose Myanmar as our adventure holiday destination*, and today that adventure kicked off! 1. Adventure Holidays – These are the destinations that stretch your horizons, challenge you, teach you something of the world, and often take you out of your comfort zone. Our favourite kind of travel! 2. Relaxation Holidays – Essential if you need to rest and recharge. For us, these trips often involve beaches, tropical seas full of coral and fish, and a complete disconnect from the digital world. 3. Family & Friend Holidays – This is when you go to visit loved ones and reconnect with people you may not have seen in years. Awesome fun, but definitely a type of trip in its own right. What we’ve learned the hard way, is that we need to be very clear up front, before we set off on a trip, what our goal is. ‘Coz if you’re after some R&R, the last thing you want is to be trekking through the jungles somewhere exotic – you’ll just get home exhausted and needing a holiday! Similarly, we’ve learned not to book ourselves into a resort on a tropical island if what we need is adventure – we just get bored and antsy. And we NEVER book a trip away to visit family if we want adventure or relaxation – spending time with loved ones, though great, gives us neither of those things! Since returning from our big adventure of 2013-2014, we’ve tried to have at least 1 of each type of holiday each year. For example, in 2017 we went to Borneo (Malaysia) on safari in April (definitely an awesome adventure); to Fiji to relax in August; and then spent Christmas with family in Aus. It’s a good balance and helps us get through the year happy and sane. 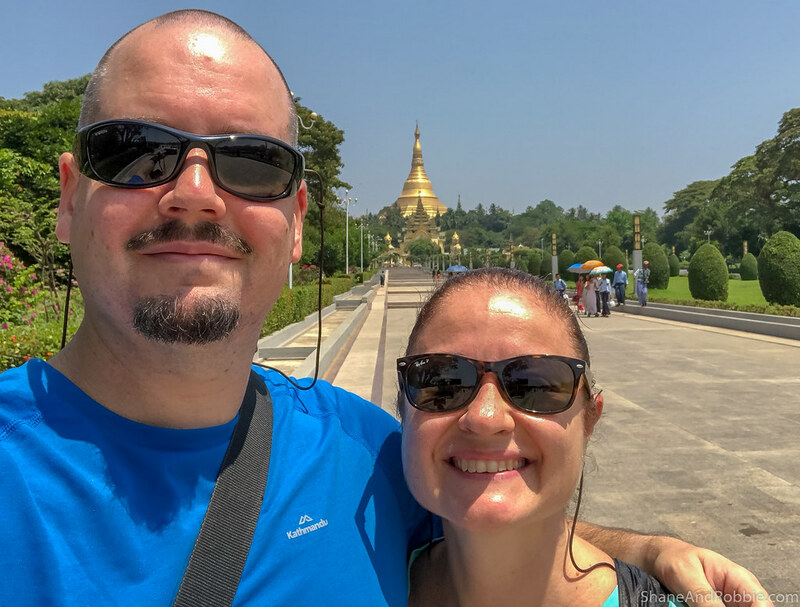 For 2018 we’re starting with our adventure holiday right here in Myanmar! We left Brisbane 11:00pm last night, and spent the wee hours trying to sleep (with limited success, thanks to bupy ride). Just as we were nodding off, however, we landed. 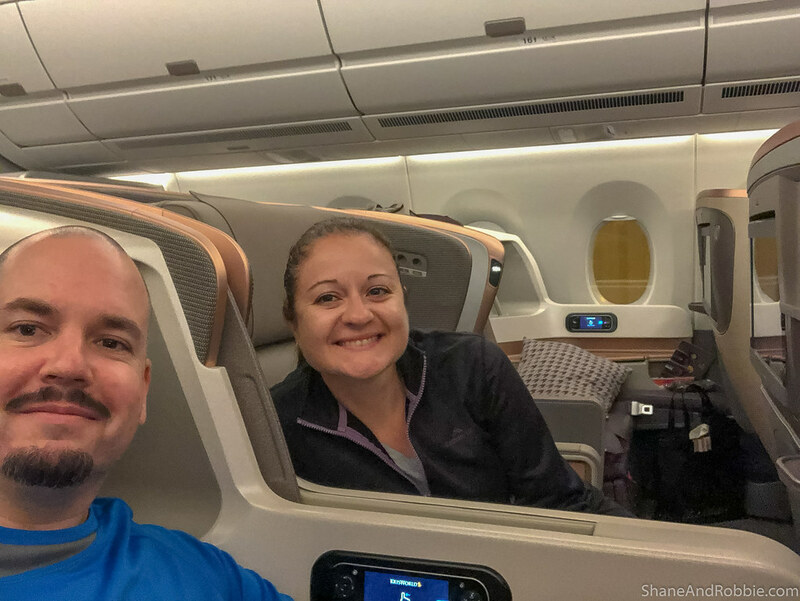 Thanks to a relentless tail wind, the usual 8 hour trip to Singapore only took us 6 hours and we landed into Chiangi Airport at 5:00am. This gave us 3 hours of lay-over, which we easily filled trawling the mall that is Singapore airport. Our connecting flight to Yangon was uneventful and brief, getting us into Myanmar’s largest city around 10:00am. After dropping our bags off at the hotel, we set off for a look around, focussed on nothing more than orienting ourselves in this new city and getting a first impression of this exciting new place. 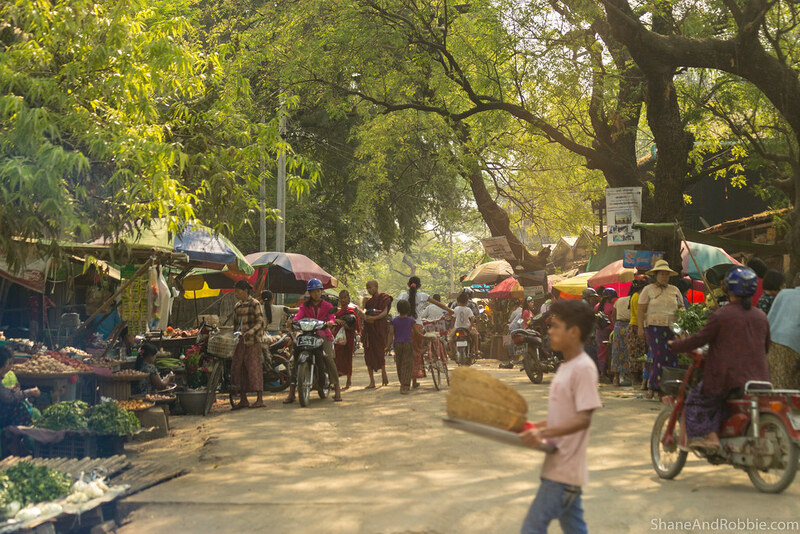 Our first impressions of Yangon is that it’s hot, and lush in the way only tropical cities can be. In sharp contrast to other South East Asian cities like Singapore, Bangkok, or Kuala Lumper however, Yangon has few high rises, and the traffic was certainly less dense and chaotic than we’ve experienced in other Asian cities. In fact, traffic was almost orderly – lane markings were actually being utilised to determine where cars should drive, and drivers seem to treat each other with a fair measure of respect. Unfortunately this respect doesn’t always seem to extend to pedestrians, with crossing the road being a type of adrenaline-inducing sport that involves picking a likely gap in traffic and ducking and weaving between moving vehicles (that don’t slow down or try to avoid you) – all at your own risk! Certainly a good way to ensure we were fully awake and alert! One of the quirks we noticed about cars here in Myanmar is that, though they drive on the right hand side of the road, there are cars with both left and right hand steering wheels driving around. Apparently there are no laws around which side of the car you have to be sitting on to drive, and with many of the cars on the roads being second hand imports from Japan and Korea, it’s a bit of a mix. 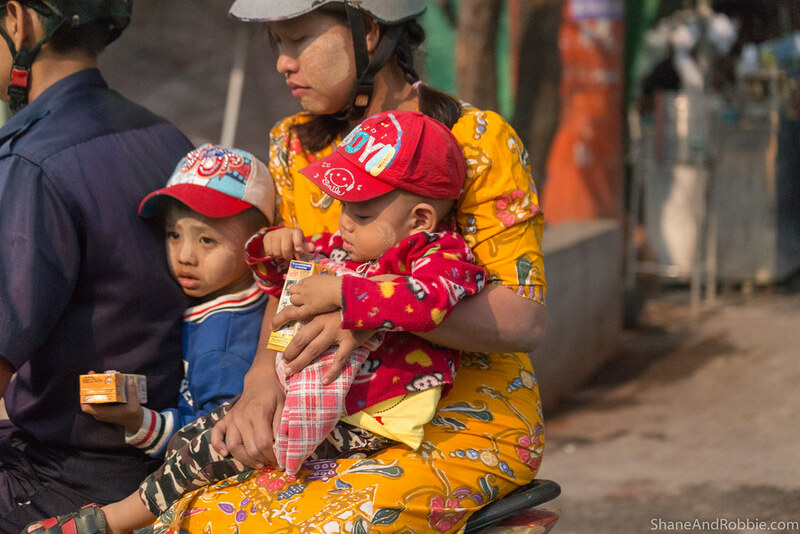 As well as cars, buses, bicycles, and trishaws (a 3-wheeled version of a rickshaw used, like in other Asian countries, to ferry paying customers between destinations), and pedestrians, the roads were full of hawkers, selling everything from fresh fruit, to sweet sticky rice, lighters, and pens. 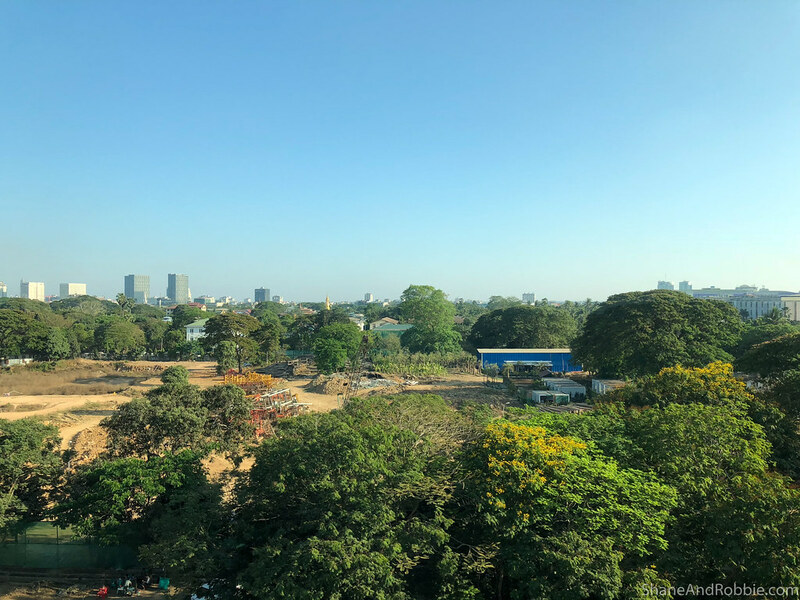 It was a cacophony off car horns*, bird calls, and voices, that combined with the colours, smells, and sights of Yangon, certainly helped shock us out of long-haul-flight-induced stupor! 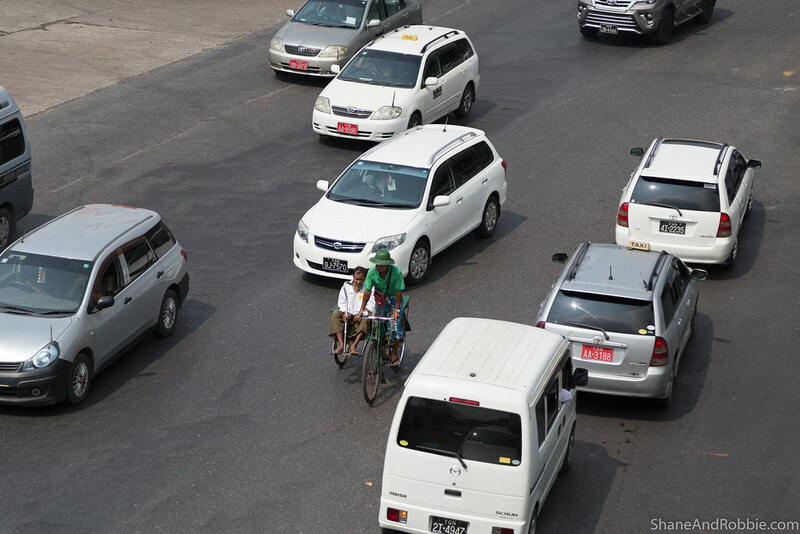 *It seems drivers in Myanmar like to communicate with each other loudly and frequently using their car horns. Their signalling seems to mean anything from “Hey watch out – I’m here”; to taxis asking passer-bys of they need a lift; to people in a hurry loudly honking slower vehicles to get out of their way. 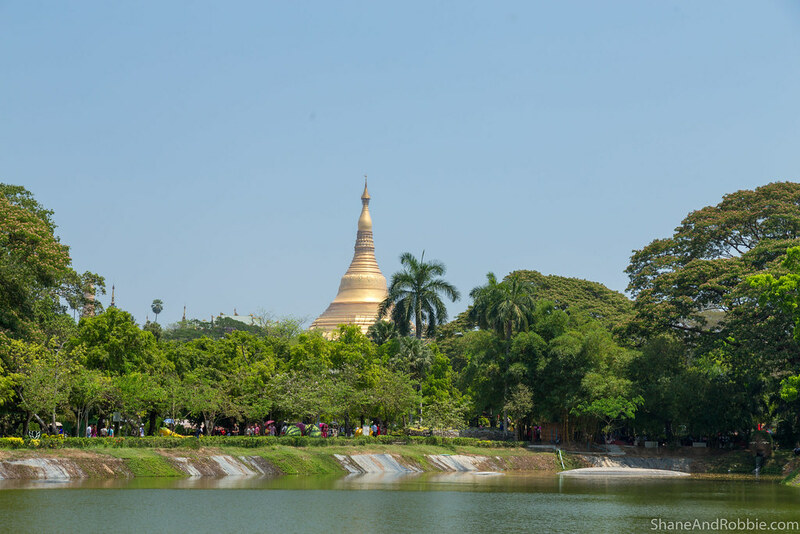 A short walk took us to People’s Park, a 136 acre public park that was a golf course during Myanmar’s days as a British colony, but now functions as a leafy green sanctuary for the residents of Yangon. It seems relaxing in People’s Park is a common pass time on weekends as the place was packed this afternoon! 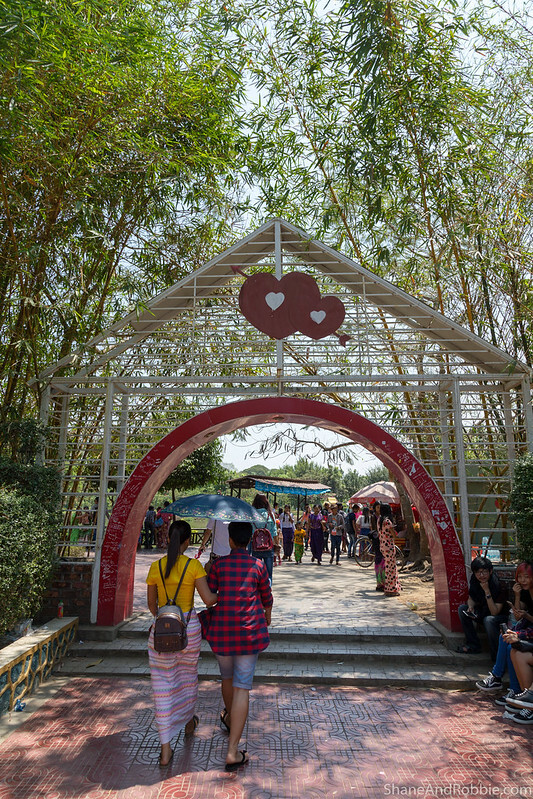 We saw families picnicking in the shade, groups of teenagers hanging out, and young couples strolling down streets together. Most of the men and women we saw were all wearing longyi, the traditional Burmese fabric skirt (i.e. sarong or kikoy) that makes perfect sense in this kind of heat and humidity! 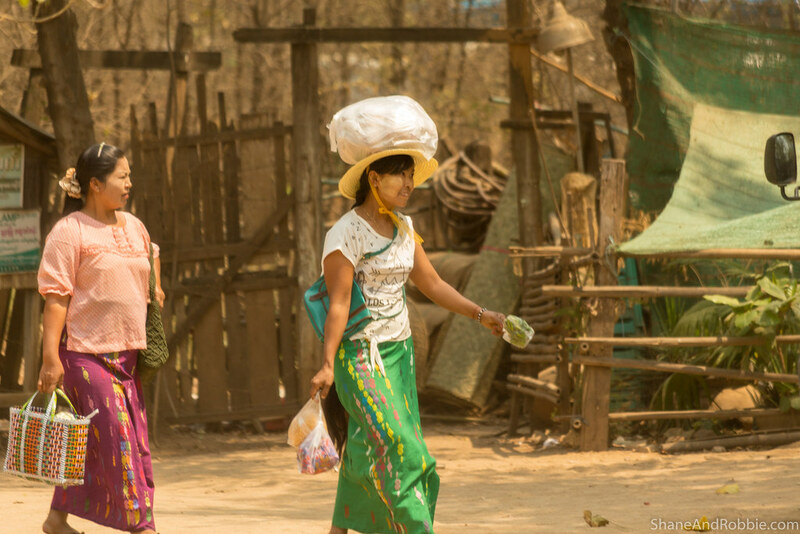 Most of the women had matching tops and longyi, in a beautiful array of colours. We even saw a couple getting their wedding photos taken in the park, dressed in traditional garb – just beautiful! Interestingly virtually all the women (and some of the men) had their faces adorned with thanakha. We’d seen some of this cosmetic facial decoration in Thailand, but here its everywhere. Turns out use of thanaka originated in Myanmar and has spread to other Asian countries as the benefits of this yellowish-white paste have become apparent. Thanaka is made from ground bark of a tree of the same name and is applied liberally to the faces and arms of women and girls (and occasionally men and boys) as a paste. The purpose of this is aesthetic, but it also acts as a natural sunscreen, a natural anti-fungal, and a protective against insect bites. A very practical aesthetic choice in a country where temperature regularly sore to be above 40oC and where mosquitos are common and voracious! 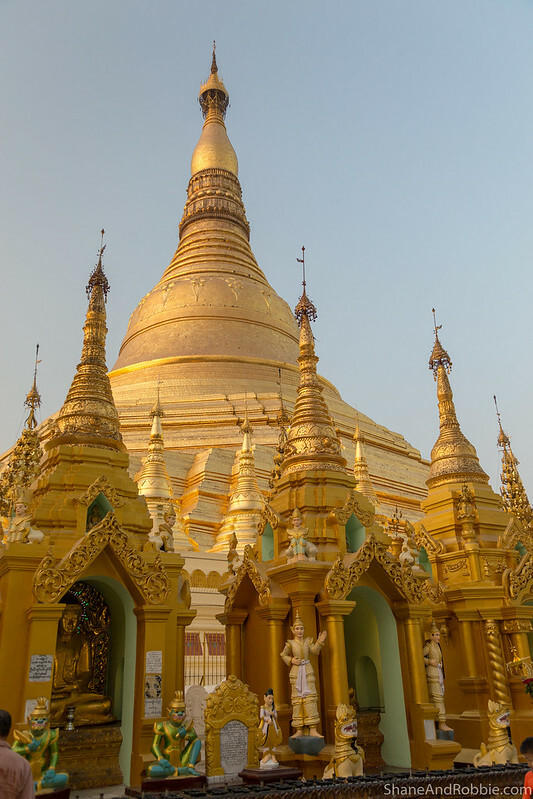 As the day began to wane and the heat lessened, we left the shade of People’s Park and continued on to Yangon’s iconic Shwedagon Pagoda. 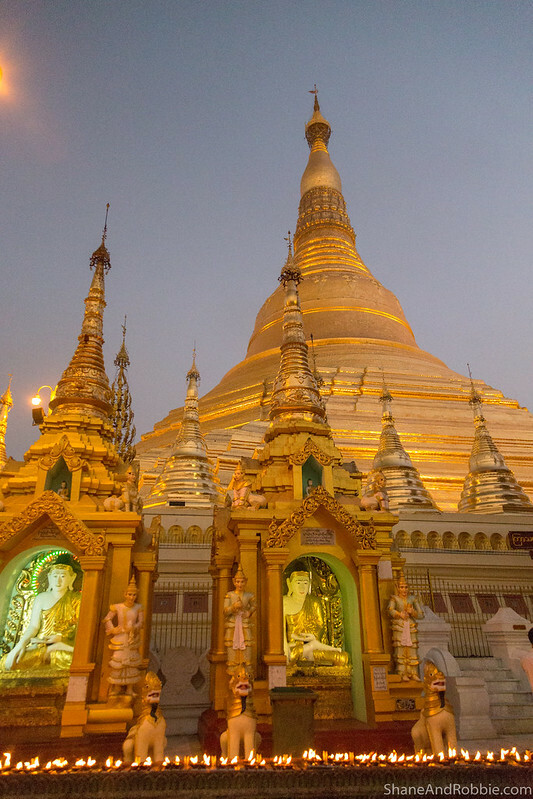 This 99m-tall Buddhist pagoda is situated on Singuttara Hill and dominates the Yangon skyline. 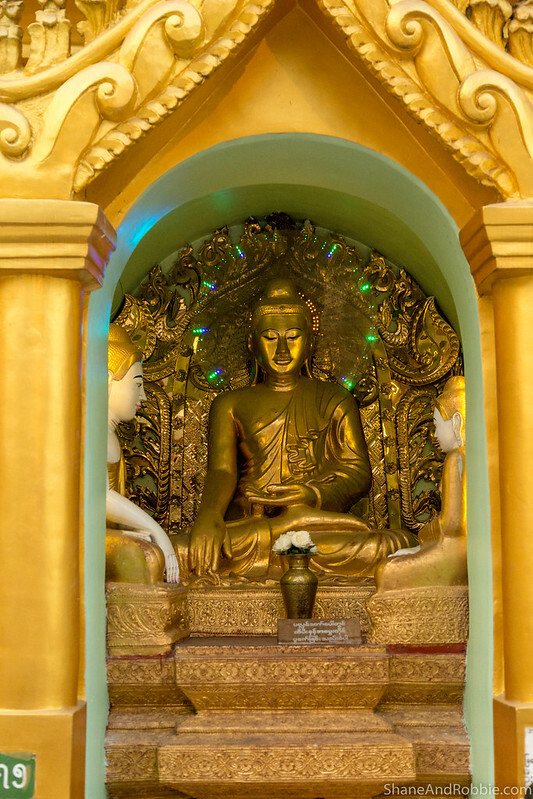 Originally constructed in the 6th century, Shwedagon Pagoda is believed to contain a number of relics associated with Buddha and is Myanmar’s most famous Buddhist pilgrimage site. Whilst we were there, in fact, we saw Buddhist nuns and monks from a number of countries praying and making offerings. The base and bell-shaped main body of the stupa is made of bricks covered with gold plates, making it a very sparkly indeed! Adding to the impressiveness of the structure is the highly ornate umbrella crown, encrusted with 5,448 diamonds and 2,317 rubies (not that we could see that from the base, but there were photos of it available to showcase the incredible gems at the top). The very top of the crown is tipped with a 76 carat (15 g) diamond. A very effective demonstration of Myanmar’s wealth in gold and gems! Myanmar is an earthquake prone country, sitting as it does at the meeting point of the Indo-Australian Plate and the Eurasian Plate. 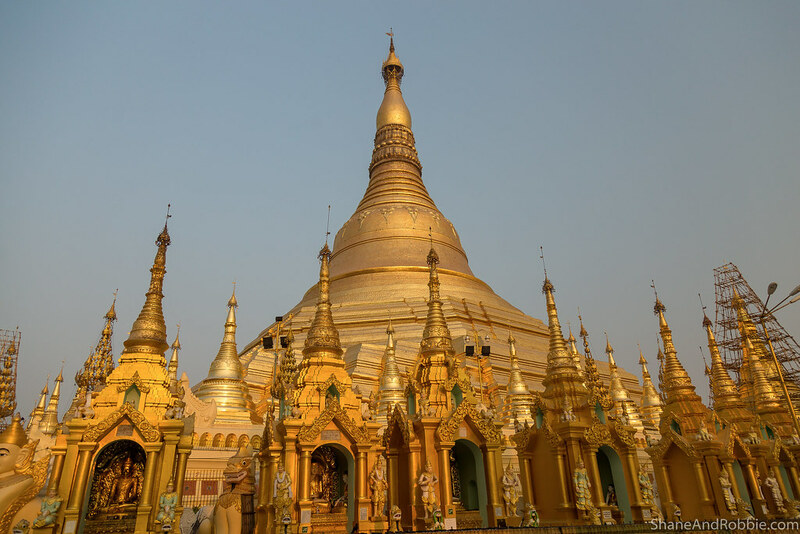 Over the centuries, therefore, Shwedagon Pagoda has been damaged a number of times. Each time, however, it was rebuilt – often bigger and better than before! 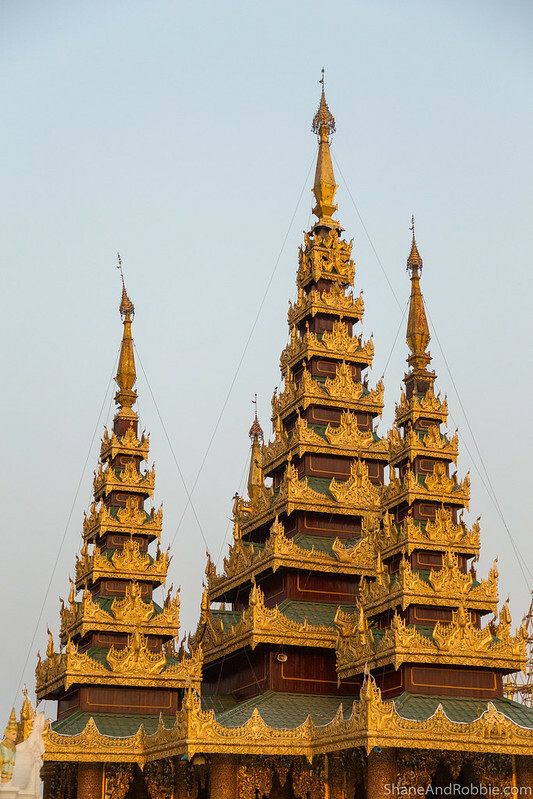 The end result today is a glittering, golden, towering edifice that is visible from just about anywhere in Yangon. 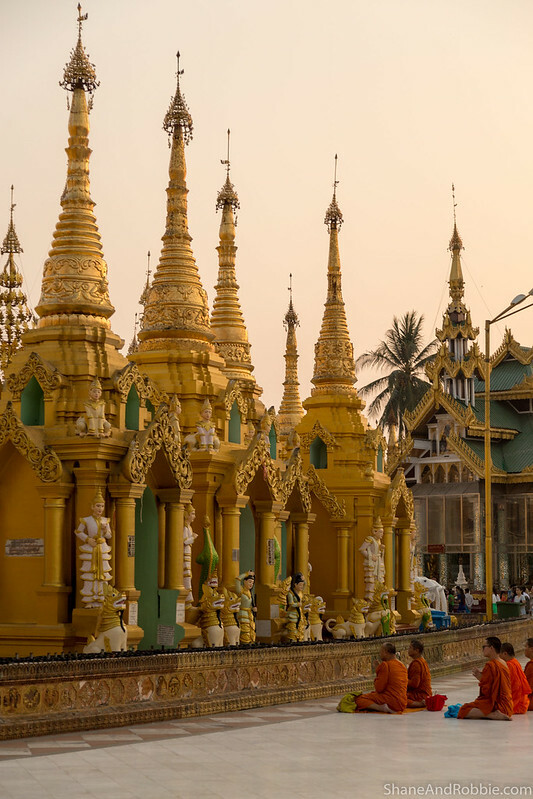 The pagoda reflected beautifully the changing colours of the sunset, and we happily spent our first evening in Maynmar on Singuttara Hill people watching and mesmerised by Shwedagon Pagoda.